Gloomy day, stocks down on last day of the year. Dow declined 101 but decliners only beat advancers by 20%. NAZ slipped 22. New 52 week NYSE lows dominated news for me, over 264 on the list. Because I don't type well, here are a few symbols of stocks I recognize on the list: C, WM, F, BAC, CC, AMD, S, WB, WYE, MAT, LIZ, ANN, VFC, and on & on. This includes banks & retailers plus clothing, drugs, cell phone providers. Groups I follow saw financials up, REIT's down while junk bond funds muddled along. On the new lows list look for: Citigroup (C), Washington Mutual (WM), Macy's (M), Ann Taylor (ANN), etc. Banking & retail remains very weak. The Dow had a great first half, but after reaching new highs early in the second half of 2007 flattened. For much of the last 6 months it has been kicking around the mid 13s, going nowhere. It probably will continue this pattern (at best) into 2008. Stocks were essentialy even, little changed & advancers equaled decliners. Negative housing news continues. That took minds off sluggish retail sales & credit crunch worries. For the month, Dow is trying to eak out a gain. It's slightly under water. Mon, the last day, will determine the outcome in what will be the worst quarter in a few years. Have a good weekend. Stocks started out on an up tone but are holding about even, although advancers are ahead of decliners 2-1. New home sales declined 9% last month to the lowest level in 12 years. Gas prices are back to $3 a gallon & forecasted to go up 10-20% by spring. Crude oil is over 97 & the Treasury bond yield declined to 4.10% as bond prices rose. Trading in stocks remains light, chances are stocks may slip by the close. The new year will be starting with a bunch of grim statistics, something to think about. I'm adding graphics. On the right is market data on DIA (it emulates the Dow Jones Industrials) & stocks I follow, statistics supplied by SeekingAlpha. In addition, on the street I was given a copy of the Wall Street Journal. To check their website, click on their name. Stock markets pulled back on negative international news & weak durable orders data. Dow declined 192, decliners outnumbered advancers more than 3-1 while NAZ was down 48. Treasury bond yields declined 8 basis point to 4.20% (bonds found many buyers). Banks & REIT's sold off while MLPs held about even after their nice run up in recent days. The early buzz on retail sales is pretty ugly. They're talking about the worst season in 5 years. Just looking at ads in the papers, the stores appear to be pressing hard for sales gains spelling lower margins on sales. Housing remains in a slump & the mortgage mess continues. Citigroup (C) is widely expected to cut their dividend to keep more cash on the balance sheet. This month the Dow is struggling to record a gain. Today it's touch & go. The assassination of Bhutto in Pakistan brought out sellers today. Dow is down 139, decliners are ahead of advancers almost 3-1 and NAZ is down 31. The killing raises concerns about oil, a lot comes from this part of the world. Oil is up 1.16 to 97.13 & the Treasury bond rose (flight to safety) reducing it's yield from 4.29 to 4.23%. Not helping was the report for durable goods, up only 0.1% (below expectations of a 2.2% figure). Banks & REITs were weak among the many losses. The MLP index pulled back 2 points to 300 after a big run up in the last few days. Volume continues low. Tax loss selling for individuals is over, one good thing in this market. Stocks hardly moved in very light trading, many investors & traders were away on holiday. Dow was essentially even with advancers equaling decliners, but NAZ was up 10. Tech looked good today. Target (TGT) & Macy's (M) declined by more than 1 each. Retail sales were not strong & margins look to be weak, investors worry final numbers may not be pretty. The next 3 days should feature light volume. Junk bond funds & REIT's pulled back while MLPs were up (less affected by tax loss selling). At least tax loss selling should be over although year end portfolio adjustments (i.e. selling) is an unknown always out there. Stocks declined on poor retail sales. Dow is down 40, decliners ahead of advancers 3-2 and NAZ is down 9. Retail sales came in sluggish at best, pretty much in line with expectations. Target (TGT) announced it expects lower same store sales in Dec, down 1.45. Another big retailer, Macy's (M) was off 1.67. Master Card said holiday spending rose a modest 3.6%. Not good. Repayment of credit card debt has slipped in recent months. The home mortgage mess continues. And oil is back over $95. But volume continues light as many are away. This was some kind of big rally day. Dow was up 99 but advance/decliners were up almost 3-1 (sort of medium for a rally day). I guess sellers were away holiday shopping, buyers were the only ones around. The MLP index (Master Limited Partnerships) was up 5 (up more than 8 in two days). REIT's were up nicely. Even junk bond funds were up, maybe tax loss selling is finished for them. But this was a holiday shortened day, volume was not heavy. The rest of the week will be up if the sellers remain away. However, fundamental problems remain in the US economy. I sense retailers are pressing hard for sales. Good for shoppers, not for them. They are giving many discounts which will probably continue. Sales should be up with margins down making for not so good results. Housing remains in the dumps and credit crunch is not over. If this proves to be an up week, enjoy. We all need them. The rally today is due to Merrill Lynch, not Santa Claus. Asian (4 markets including Japan were closed) & European markets were up in light trading. Rally enthusiasm extended to NY. Dow is up 88 & advancers beat declines almost 4-1 on light volume (as in foreign markets). Interesting that new lows beat new highs 99 to 88, not a happy time for every investor. The only major news item is Merrill Lynch (MER) is getting an investment of over $6B from Singapore's Temasek Holdings & U.S. money manager Davis Selected Advisers, to help it through it's financial crisis. The news came out last week, MER is down fractionally. The rest of the week should be quiet. I also like Bassets. These guys wish everybody a joyful holiday season. Dow Jones bounced in a sideways fashion until today. It gapped up on the opening, today's 200 point gain gave it a 1% gain for the week. Not bad. Even banks did well today. The big ones I follow were up a good 1% each. But Washington Mutual (WM) was down. The largest S&L in the country is being investigated, sounds bad. The stock has cut the dividend sharply, 14 is it's lowest price in 11 years. Countrywide (CFC), still below 9, the country's largest owner of mortgages, is also being investigated on many fronts. Next week should be good for the markets, time for the year end rally. Can't wait to see! Walgreen (WAG) brings out buyers. Walgreen reported earnings ahead of estimates, they're up $2.72. I always liked them, among other things, my mother was a big customer. They're a member of the S&P 500 Dividend Aristocrats, only wish they had a nicer yield. Circuit City is the leading decliner, down $1.83. Dow is up 209, but advancers beat decliners "only" 3-1. Now traders will decide what to do in the next 1/2 hour when closing out their options. Research in Motion (RIMM, up 12) & Merrill Lynch (MER, up $1.50) reports brought out buyers. RIMM (maker of the BlackBerry) had a great third quarter and MER is expected to get a $5B infusion of capital after facing large write downs from losing bets on subprime mortgages. The investment is expected from Singapore state-owned investment agency, Temasek Holdings. I still remember their old ads, "Merrill Lynch, Merrill Lynch is bullish on America!" It turns out those ads were made in Mexico. Dow is up 153, advancers are 4-1 ahead of decliners and NAZ is up 31. NYSE had record volume in the first 1/2 hour due to "quadruple witching" marking the simultaneous expiration of contracts for stock index futures, stock index options, stock options & single stock futures. The Treasury bond yield is 4.11%, little changed in recent days. Circuit City (CC) reported a larger than expected loss, down $1.40. With witching and going into the end of month (also year end), the rest of today's market is up in the air. Another sideways day, not a lot happening in the averages. Individual stories were interesting. Research in Motion (RIMM, the maker of the BlackBerry)) reported 3rd quarter profits more than doubled, up 5. Master Limited Partnerships (MLPs) Alerian index was down 2 , on it's low for the last five months. They're testing! Banks were weak for the usual reasons. Bank of America (BAC) is hovering just below it's critical 42 level. Testing again! Countrywide is under 9, same reasons there. Interesting fallout from the bad loan mess at banks, SunTrust (STI) sold about 10% of it's almost 50MM Coca Cola shares, it's held for almost 90 years, to protect investors of 2 of it's funds. Coke was down 57¢ & SunTrust was down $2.40. Ugh!! Year end is approaching but with uncertainty about loans, the economy, inflation, the FED, etc. being so high, I think this market will continue in Jan.
Stocks slipping & sliding again. The Dow started out up 50, sounds good. But it has been sliding to where it's down 30, decliners are beating advancers 2-1. NAZ is up 10, helped by Oracle's (ORCL) earnings announcement after yesterday's close. They're up 1.39, nice gain. Today Bear Stearns (BSC) reported it's first quarterly loss, but it was less bad than had been feared. They're down only 1.39. FedEx fell 1.22 after posting a 6% decline in quarterly earnings due to high fuel costs & slowdown in the US economic. What's new? Dow has been kicking around the low end of the 13-14K range all month. This range bound behavior probably will continue in the final days of Dec.
Asian markets are mixed following that kind of day here. Dow futures are down 16, an essentially even signal for tomorrow here. I get deluxe cable service which includes CNBC Asia & Bloomberg TV giving stock market's performance during our overnight period. They just reported that Shanghai market has almost doubled this year. Their index is 5000, up 2300. Of course it is down from over 6000 two months ago. The US imports roughly $300B net imports yearly. This is a very large & fast growing economy. Many US businesses are looking to expand their presence in China. That spells growth. This was another see-saw day. The markets ended up mixed, after ups and downs during the day. The Morgan Stanley (MS) news was important, showing that foreign investors, especially from Aisa & the middle east, are willing to invest in the US. After the close, Oracle (ORCL) reported earnings beat estimates. That may give a lift to the markets tomorrow when buyers can not get excited but sellers are not panicking. The Dow continues kicking around the low 13's. Just 6 days trading days left in the year, only 3 for tax loss selling. This year I learned about master limited partnerships & like their businesses. Below is the graph of the Alerian index which contains over 50 partnerships. Notice the fairly flat line centered around 300 since Aug, however since early Nov it has been slipping at a slow pace. It looks like it wants to test the closing low of 291. Stocks are mixed although decliners lead advancers almost 2-1, nothing dramatic. Investors were disappointed by Morgan Stanley's larger than expected quarterly loss of $3.6B (down from a profit of 2.2B last year) but encouraged by China's $5 billion investment in MS. Morgan Stanley had to write down $9.4 billion (remember when that was a big deal?) from bad bets on mortgage loans, the stock was up 1.57. Even in tough economic times, US firms are increasingly finding buyers by government agencies overseas, Citigroup (C) recently sold $7.5 billion in shares to Abu Dhabi Investment Authority. Expect more of these type deals in the future. Crude oil supplies dropped more than expected last week, oil was up 1 to over 91. Ugly stories keep coming out about the mortgage mess here which affects banking institutions all over the world. Let's see how this negative news, tax loss selling and year end adjustments play out. Stocks rebounded in the afternoon. Dow ended up 65, advancers beat decliners 3-2 & NAZ was up 21. In the afternoon the European Central Bank's $500B loan & profit gains at Goldman Sachs and Best Buy looked better to the market. Best Buy (BBY) ended up 48¢ while Goldman (GS) was down "only" 7. Go figgah! Problems such as credit crunch, terrible housing market, sluggish retail sales & high price oil remain. Bank of America (BAC) remains just under 42, a sensitive point in recent years. It's still trying to make up it's mind which way to go. Early this morning I turned on Bloomberg TV to find Dow was up 99 in pre-market trading, sounds like an up day. Not so far. Dow started with a nice gain but fell to down 54. Advancers are ahead of decliners about 3-2 & NAZ is down 12. The Treasury bond yield declined to 4.10% (defensive buying of Treasuries). Oil slipped back to 89, not much help for the stock market. Big news items are European Central Bank will issue of $500B in bonds for help with the credit crunch plus profit gains at Goldman Sachs (GS) and Best Buy (BBY). Unfortunately Goldman Sachs is down 8 while Best Buy is down 1 (down 2 earlier). They're worried about the quality of Goldman earnings & Best Buy has a confusing picture about better results which are only so-so. Housing starts fell 4% to the lowest level in more than 16 years & building permits fell 1.5%. This news brings out sellers. Stocks down again. Dow declined 173, decliners beat advancers 4-1 and NAZ was down 61. Ouch! Pretty much the same story. Caterpillar (CAT) was downgraded by Morgan Stanley & slipped 2.23. Retail sales are forecasted to come in with gains of 4-6% depending on who you read, so-so. Plenty of economic worries to keep the market nervous. Since this is a period pre holiday period, these conditions may drag on for the rest of the week. Happy Holidays brings a picture of joy!! OK the picture is a little old, but an excellent one. Maybe I feel that way because I took it. 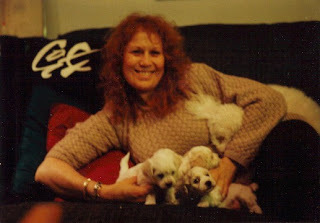 Look for the mother Bichon under my friend's arm plus 4 puppies in front. Now the puppies are in their middle years. My friend still has the mother & one of the four. They're all saying: HAPPY HOLIDAYS!! Dow is down 78, decliners beat advancers 5-2 & NAZ is down 33. Oil slipped to 90 and the long bond yields 4.2% or down .03%. NY is following declines in Asian & European markets. Credit crunch worries and the ability to save are keeping buyers away. Interestingly the dollar has strengthened against foreign currencies in the last couple of weeks, i.e. the Euro pulled back to $1.43 & the yen is now over 113. In corporate developments, Ingersoll-Rand (IR down 4.50) is buying Trane (TT up 8.50). It's nice to see some corps have cash to buy other corps. Leveraged buyouts, so popular earlier this year, are pretty much history today. Retail sales seem to be coming in so-so. Online retailers are now maturing, rapid growth rates are diminishing. Stores are probably doing OK but not great. Cold weather in the east will help clothing sales, but the remaining business may be nothing special. Cold weather hurts home sales which don't need more problems. Damage in our markets on Fri is pulling Asian markets broadly, down 1-3%. They're worried that the FED might slow rate cuts after inflation data reported last week. Dow futures down 52 already, looks like a weak opening tomorrow morning a few hours away. Tax loss selling or the tough economy gave us another down week. Junk bond funds & REIT's declined, tax loss selling may have contributed. The Alerian MLP index is hanging in there flat at 295. I don't watch the S&P 500 Dividend Aristocrats specifically, each one has a different story. However Coca Cola (KO) & Pepsi (PEP) are included, they reached new 52 week highs. Other housing related ones like Masco (MAS) & Stanley Works (SWK) were down. This should be another tough week given the underlying news stories about credit crunch, declining housing & retail sales not to mention high oil prices. Have a Diet Coke to relax! Out of the gate on Mon AM - Australia, New Zealand & Tokyo stock markets are down - Asian markets are set for a weak start after Fri in NY. Another rough week. Dow dropped 178, advancers beat decliners about 4-1 today. Looks like it dropped about 300 this week. I think traders read my blog this morning & sold off. They are worrying abut the FED's ability to cut interest rates with threats of inflation. Banks had a bad week as did REIT's & housing related stocks. However MLPs index is pretty much glued to 295 although some are doing better than others. Coke (KO) and Pepsi (PEP) reached 52 week highs, that's where the money is going. I think Dow will be testing 13K next week, i.e. down. Bank of America is testing 42. I'm not a big technical guy, but hard not to notice. That's been it's floor in the last 3 years. The year prior, that was roughly it's ceiling. Next week we'll find out if goes thru the floor. While the market is down, I'll give a plug to 2 links: Joe got me started & keeps me updated on MLPs at limitedpartnerships and I also like stockblogs. Check them out, good to keep busy by studying in tough markets. Inflation worries, that'll do it. The Dow is down 67 & decliners outnumber advancers 2-1, but no big declines. NAZ is only down 3, oil pulled back to 91.50 & the Treasury bond yield is back at 4.23% (up almost 50 basis points from a couple weeks ago). Nov CPI index was up .8% while core inflation (excluding energy & food) was up .6%. Both are bigger numbers than expected raising concerns about he FED's ability to lower interest rates. Citigroup (C) said, get ready for this, "it plans to move assets from seven 'structured investment vehicles' onto its books and put up $49 billion to help the SIVs repay their debts." Does anybody know what that means? That's sort of assumed to be "good" by the experts, Citi's up 45 cents, OK! I guess the idea is, what's a few billion among friends? Moody's cut Citi's credit rating last night because Citi is straining it's finances. Their dividend is in question. Other banks aren't much better off, credit crunch problems drag on. Stocks ended mixed. They pulled back out of the the gate this morning but Dow finished up 44 while NAZ & S&P500 were essentially even. Decliners beat advancers 2-1, that's a down day. Wholesale prices of 3.2% touched off inflation fears partially overshadowing a strong (3.2%) increase in retail sales last month. Banks rebounded in the last hour reducing their losses but were typically still down about 1%. Honeywell, a Dow company, was up 3 after an optimistic outlook for next year. Credit crunch seems to be one long word these days, there are still plenty of problems out there. Housing remains soggy. But the markets aren't ready to test the low end of the trading range (13-14K) they've been in since July. Stocks down after mixed economic news. Dow was down 70, decliners ahead of advancers better than 3-1 while NAZ pulled back 23. Wholesale prices spiked up 3.2% & there was more uncertainty about plans to ease tightness in the credit markets. However retail sales were up 1.2%, the largest gain in 6 months. Worries about price increases may give the FED thoughts about being careful when lowering interest rates. Plus the plan by the FED & other central European banks to combat what they describe as elevated pressures in the credit markets is causing a lot to scratch their heads, i.e. more uncertainty. Financials continue on their bumpy road. Washington Mutual (WM), Citigroup (C), Countrywide (CFC), Bank of America (BAC), JP Morgan Chase, (JPM), Wells Fargo (WFC), Wachovia (WB) are all selling off today. Countrywide, the nation's largest mortgage lender, has a ton of problems. Today the Attorney General in Ill. announced an investigation into their lending practices. Their stock is back below 10, yielding 6% assuming the dividend continues. Meanwhile oil pulled back to 93, still quite high. The long Treasury bond yield is up to 4.14% (bonds are being sold). It looks like the next 2 weeks will be bumpy for stocks if not down & I have a feeling Jan will not give us the traditional rally many expect. The major Asian markets (China, Hong Kong, Japan) pulled back continuing the weak performance in the US. I forgot to mention before, oil is back over 94 as supplies in US were lower than expected. Cold weather does that. Asian markets are also big buyers of oil. Coca Cola (KO) was up again today. This is a stock in my IRA, I keep my eyes on it. Coca Cola was up while banks were hammered, telling you were money is flowing (sort of flight to safety). The 10 year treasury yields 4.08%. I think tomorrow will be another tough day in the markets. This was some kind of day. The Dow rallied with a 272 point gain out of the gate. Then it pulled back to a 100 point loss but rallied at the close to end with a 41 point gain. Advancers equaled decliners. OK. The news from the FED about arranging liquidity with other central banks caused the market to rally. Then the markets tried to figure out what it really meant & if it would do any good. Banking news, all negative, started having it's effect on the markets causing the declines. Banks have been investing in complicated new loan products we don't understand. Given the billions that are being written off day after day, it appears they don't understand these products either. I still like financials, especially banks, but it looks like it's not a good idea buying these stocks before they get their problems sorted out (i.e. in the future). There was good news. ATT (T) had great news yesterday. Another Dow, MMM (MMM) today had a favorable announcement about it's future. But rough times for banks is affecting the entire market. Stocks are pulling back. Dow is up only 41 & advancers over decliners has fallen to 2-1. Maybe negative words from the major banks are sinking in. Stocks were up nicely after the FED announced a plan to work with global banks to prevent a financial crisis. Dow is up 155 , advancers beat decliners 3-1 and NAZ is up 43. All that sounds pretty good, except.... Bank of America (BAC), Wachovia (WB), PNC Financial Services (PNC), Sallie Mae (SLM), you get the idea, all announced much bigger provisions for loan losses not to mention dreary outlooks. In an up day, they're each down 1-2. I really like BAC because they are in the S&P Dividend Aristocrats group but the idea of accepting a very bumpy quarter or two is unnerving to say the least. Banks are the backbone of the economy. When they are doing badly, it doesn't speak well for the rest of the economy. Disappointment is an understatement. After the FED cut the funds rate by "only" ¼ point, the markets sold off big. Also there were not the comforting words in their statement investors were looking for. Dow was down 294 and advancers beat decliners more than 5-1. I think they read my blog and wanted to prove me wrong, so they decided on just ¼ point cut. Bonds rose sharply, reducing their yield to 3.99%. Tomorrow morning will probably see a big selloff first thing. After today's meeting, the rest of the year could see a lot of selling. In addition, tax loss selling may become more significant. This is the time to line up value stocks & look for buying points at lower prices. Stocks are mixed although decliners lead advancers 3-2. Everybody's waiting for the FED announcement on cutting interest rates. Freddie Mac (FRE) said their losses will be a good $6-7B worse than thought (down 2). H&R Block (HRB) is down a little, still trying to deal with huge losses on their mortgage portfolio. Washington Mutual (WM), the country's largest S&L, invests primarily in mortgages, sold $2.5B in stock which will add equity to the balance sheet. Can you spell "uh-oh?" There is some good news. AT&T (T) announced a big dividend increase, they are optimistic about the future making my friend happy. Now she can buy more goodies. Hang in there. In a couple of hours we'll hear from the FED. Asian markets are up roughly 1/2 percent betting the rate cut tomorrow will be 1/4 point. The FED meting tomorrow brings out the buyers today. The Dow was up 100 while NAZ was up 12. Advance/decline ratio was almost 2, not very exciting on a major up day. Volume was a little light, again fairly typical on the day before a meeting. They are expecting rate cuts for Fed Funds & the discount rate with hopes the Fed Funds rate will be cut ½ point. The FED seems anxious to please, I'm expecting the bigger rate cut. Largely gone unnoticed, the Treasury bond has fallen back raising the yield to 4.15% up 30 basis points from just a few days ago. Maybe some of that money has been going into stocks. About all we can do now is wait & see how the stock market plays out tomorrow. In terms of bargains, MLPs have been trading flat for a few weeks. Nothing wrong, that's the way it is. They have nice yields & generally are quick to raise distributions. They are tax efficient but all represent tax hassle. Bargain hunters might take a look. It looks like all you have to do to make money is throw darts. That is working today. Dow is up 97 & NAZ is up 14. Advancers are ahead of decliners better than 2-1, not so great in today's market. Stocks I watch are all up nicely. Obviously the rate cuts tomorrow are bring out buyers from the woodwork today. Last week the market was up nicely although banks, MLPs, REITs & junk funds were flat at best. Maybe tax loss selling held them back. UBS is writing off $10 billion in subprime loans, they're up 1. McDonalds (MCD) report same store sales up 8% last month with much of the gains from overseas. They're up 1+. A big gain tomorrow will push the Dow near 14K, near it's record from reached a few months ago. For my money, that's too much too fast. But the Dec rally is in full swing so enjoy it. Now you know I like beagles. When I was a kid, we had a beagle. They are cute. Even my mother got to like the dog, putting it's picture first in her wallet. This picture was saved from years ago & continues to be one of my favorites. Stock averages barely changed by the end of the day. Advancers were a little ahead of decliners. Traders are waiting for the FED meeting on Tues, there probably will not be a lot happening on Mon. The bet is ¼ point rate cut, but I think it will be ½ point to make the financials happy. The Treasury bond yield rose to 4.12% as bond sellers cashed in profits. I wonder where their money is going. Smith & Wesson Holding Corp (SWHC) dropped about 3 after cutting it's outlook for 2008. Want to help, buy more guns. After all the excitement in recent days, the stock markets quieted down. The markets in Asia & Europe were up following the lead of our market yesterday, they like the subprime fix announced. Today our traders were mildly disappointed by the jobs report from the Labor Department. No big news, maybe the markets need some time to digest recent gains. Dow & NAZ are about even, advancers are slightly ahead of decliners on the big board. Oil fell back to 88 while the Treasury bond remains near 4%. If the Dow holds it will be up 2% this week, not a bad start for Dec. The subprime "fix" news is getting a lot of attention. There are about 3MM adjustable rate subprime loans, about 19% are past due. Without help more will become past due with higher resets in the coming months. The help is not a quick fix & only applies to marginal loans needing help. At the toll free phone number, callers are told there would be "lots of hoops to jump through" to obtain the five-year freeze. This program is voluntary & will vary depending on the lender. Can you spell, "uh-oh?" Reality is setting in & sounding a lot worse than many had originally thought. The subprime mess is not only big but global in nature. Mortgages are sold in pools to financial institutions around the world. Asian & European banks have already taken big write-offs on their investments. Northern Rock, the largest lender in UK, has been struggling for weeks trying to remain alive dealing with a huge mortgage portfolio. Countrywide (CFC), our largest mortgage holder, has rebounded to 10, they're still struggling. They know & are trying to prevent more foreclosures which will add houses to an already soggy housing market. Enjoy the up market this week. Tues, it should be up big after the FED interest rate cut announcement. Then we'll worry about the future. News stories tonight are trying to figure out how the freeze on mortgage rates will affect borrowers & lenders. There are a lot of worries that not enough borrowers will be helped. Lenders (who are now mortgage holders around the world after buying pools of mortgages) have to be biting their lips. They figure collecting payments with lower interest rates is preferable to foreclosing & reselling properties in a difficult time. Maybe, but the market values of mortgage portfolios have to be less with lower interest income. Interest rates cut by the FED on Tues will not solve these mortgage problems. Tonight Asian markets are up following through on gains here. Oil is back at 90 and the Treasury bond rate is up to 4.0%. I think buyers will rule in tomorrow's markets here. The stock market rallied with high hopes for a Fed rate cut & the plan for freezing mortgage rates. Dow was up 175, advancers beat declines 5-1 while NAZ was up 43. Volume was only medium but it looks like the next stop will be pushing the record above 14K. Just about every stock I followed was up, second day in row. Stocks got a boost with the announcement allowing some homeowners facing foreclosure to freeze their interest rates up to five years & refinance their mortgages. The plan created by the Treasury Department, mortgage lenders & banks could help over 1 million homeowners. I think mortgage holders may be in for a rude shock when they reprice their loans down based on low interest rates for 5 years. It looks like the stock market figures tomorrow will take of itself. Jonathan Pond offers a discussion on PBS stations about how to grow your money for retirement, very smart investing is needed. He talks about big pictures issues which will be help those looking for assistance. Check your local PBS station to learn more. Stocks rose modestly as sluggish retail sales did not bother the markets. Dow is up 46, advancers are 2-1 over decliners & NAZ is up 17. There is hope that another interest rate cut & a government plan to keep mortgage rates from spiking will help companies hurt by the housing crisis. They better get going soon with help for mortgages as foreclosures hit a record level of 0.78% in the third quarter. The housing slump's impact on consumers adds to worries that the holiday shopping season is getting off to a shaky start. Target (TGT) is down 5 after announcing that Dec sales will come in below forecast. Walmart (WMT) is projecting same store sales up 1-3%. This sounds like uh-oh to me. Hard to miss today, you could have thrown darts! Dow was up about 200 while NAZ rose almost 50. I'm still trying to sort this out. I guess the idea is the economy is doing well, but not so well that it does not deserve a rate cut next week. Fannie Mae (FNM) was up 97¢ with their dividend cut. Oil pulled back to under 88. Maybe this is the start of the Dec rally widely expected. The administration worked out an agreement with industry to freeze interest rates for certain sub prime mortgages for five years to combat soaring foreclosures. Details will be announced. In the old days, that would have been called government meddling, viewed as bad. In the mean time, enjoy the up market. Even with the Dow up 173 today, the chart below shows it's been pretty much sideways in the last 5 days after a big runup in the middle of last week. Economic data showing the economy is strong brought out the buyers today. But I'm not sure how to reconcile that with an interest rate cut next week because the economy needs help. Looks like today will be another major up day. Fannie Mae (FNM) slipped after cutting the dividend and selling preferred stock to raise capital. OPEC met & decided not to increase oil production which generally would send oil prices down. Among other things, they are worried about sub prime problems. Oil remains around 89. Pessimism prevails about the stock market. The Dow closed down 66 (lows of the day) while NAZ dropped 17. Decliners beat advancers almost 2-1. Oil pulled back to "only" 88 and the Treasury bond interest rate remains at 3.89%. Nothing dramatic went on, although downgrading by JPMorgan of the financials was a kick in the head the market took seriously. Banks are giving up some of the gains from last week. Dec has been an "up" month but you wouldn't know it after the first 2 days. Another mediocre day for stocks, Dow's down 32 while NAZ is down 8. Decliners outnumber advancers about 2-1 at NYSE. The Treasury bond is 3.89% and oil is near 88. Dow Chemical (DOW) announced it will cut 1000 jobs worldwide. Merck (MRK) reaffirmed it's optimistic outlook for next year but part of that is based on job cuts this year followed by more next year. The stock market is always waiting for more economic news but the FED meeting next week is probably drawing the most attention. The market assumes a rate cut is a given, the size is the only thing being debated. JPMorgan downgraded major Wall Street securities firms because of longer-term concerns about risk management hurting overall valuations. Big banks were included in this assessment. The market continues to drift (i.e. down). Stocks give some of their big gains of the last few days, but nothing major. Dow was down 57 while NAZ pulled back 24. The decliners beat advancers 3-2. Traders were trying to figure out where the economy is going. GE (GE) gave a cautious outlook for next year. It looks like awaiting developments described the mood today. I watch banks closely, they gave up some of last week's gains. This is tax selling month not to mention various funds adjusting for year end results. While Dec has been a good month, anything is possible. For the time being, next week's FED meeting on interest rates seems to be one of the big market movers. Oil is under 90 & the Treasury bond rate is under 3.90%. Who knows what's going on? On tax loss selling, financials, REITs & especially junk bond funds may decline. Watch your favorites to look for future bargains. Today's turning out to be another mixed day. It looks like traders need a breather after excitement in the last 4 days. The NYSE recovered after early morning losses, taking the Dow above break even. Advancers equal decliners, not a lot going on so far. Henry Paulson, Treasury Secretary, expects an agreement to help thousands of homeowners avoid mortgage defaults by temporarily holding their interest rates steady. Paulson also said this is the worst housing pullback in more than 20 years. The Treasury bond's interest rate is 3.94% and oil pulled back to 87. Earlier, overseas markets were mixed. Enjoy the quiet day, I think more excitement lays ahead. Sub prime loans continue to be a major problem area. The Treasury plans to rescue home loan borrowers by freezing low introductory interest rates before they soar. But this "fix" may not solve fundamental loan problems which are far-reaching. It won't spare many borrowers & bankers from the pain of escalating foreclosures & defaults, borrowers will still be required to make monthly payments. The housing market's ongoing problems can drag on.